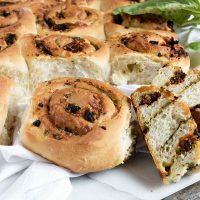 Light and fluffy pull apart rolls, filled with pesto, sundried tomato, cheese and basil. For the pesto (if making): Combine all ingredients in a food processor and process until smooth. Set aside. For the roll dough: *If using dry active yeast, proof the yeast in 1/4 cup warm water, then reduce the amount of remaining water you add to 1 cup. Combine the flour, instant yeast, sugar and salt in a large mixing bowl or the bowl of a stand mixer fitted with a kneading hook. Add the water to the flour mixture, along with the olive oil. Start mixing until the ingredients start to clump together as a dough. If the dough seems a little dry, add a bit more water. If sticky, add a bit more flour. Once combined, knead for 5-7 minutes by hand or for 3 minutes on medium speed in your mixer. The dough is ready when it feels soft and smooth. Place dough into a greased bowl, turning it over and coating the sides of the bowl in oil. Cover with plastic wrap and set aside in a warm place to double in size, 1-2 hours, depending on the room temperature. Line a baking tray with parchment. Uncover the dough and punch it down a couple of times. Turn out onto a floured work surface and dust the top of the dough with a little flour too, if it is sticky. Roll the dough out to a rectangle, roughly 16 x 12-inches. Spread the pesto over the dough, then scatter over the chopped sundried tomatoes, both cheeses and the basil leaves. Roll the dough up jelly roll style, rolling from one of the longer sides. Using a sharp knife, cut the dough into 12 even pieces. Place rolls onto the prepared baking tray, cut-side up, 3 rolls across and 4 rolls down, making sure the open end of each roll is tucked in towards the centre on the pan. This will prevent the rolls from uncoiling during cooking. Leave a little space between each roll as they will grow and touch as they prove. Loosely cover with greased plastic wrap and allow to rise for 30 minutes to 1 hour, or until almost doubled in size again. Once doubled, bake in the preheated oven for 35-40 mins until golden brown and the centre looks dry and not doughy. Remove from the oven and leave to cool for at least 10 mins. Enjoy warm or at room temperature.